← So, where are we going with this? If you live in town, once you have a network that spans your house and yard, you’re pretty much done. You might want to put up cameras around the house or link in your watering system so you can control it over the internet, but, once you have the router set up, the network-building part is finished. If you live in the country, though, you typically have a house, a garage, a workshop (or two), offices, barns, stables, and a wide variety of other possible outbuildings, as well as fields, storage facilities, waterways, etc. Your $35 wireless router will not reach all these places, and a $200 router will only do slightly better. Nor is “hard-wiring” an option: Ethernet can only go 100 meters, and, although fiber cable can go farther, running cable is a difficult and prone to needing repair (critters seem to love cable, especially for lunch). Wi-fi is the answer, but not the typical wi-fi router. A typical “consumer-grade” wi-fi router has an output power of 60 milliWatts (mW), or 0.06 watts, to a 2 deciBel omnidirectional antenna, which gives it an “Effective Isotropic Radiated Power” (EIRP) of about 100 mW or 0.1 Watts. If that doesn’t sound like much, that’s because it’s not – it is designed to provide a wi-fi signal inside a suburban house while not interfering with the house next door. The Federal Communications Commission (FCC) and Industry Canada (IC), however, allow unlicensed “point-to-multipoint” stations on 2.4 GHz, like a wi-fi access point, to operate up to 1 Watt of power to a 6 dB antenna, for a total EIRP of 4 watts. Where do I find a device with a whole lot more power? What do I do to get the most range out of it? The first one is easy: there are a few companies out there building high-power, low-cost access points for the Wireless ISP (WISP) market. The second one, however, is a little tougher. Wi-fi, at least the “b,” “g,” and “n” variants operate at 2.4 GHz (“n” can also operate simultaneously on 5.8 GHz), which is a very high radio frequency. For reference, cell phones operate at 0.8 GHz (sometimes at 1.9 GHz. ), and FM radio operates at 0.1 GHz (100 MHz). So, to get the best range from your wi-fi access point, you want to have it outside, so it doesn’t have to pass through the walls of your house. 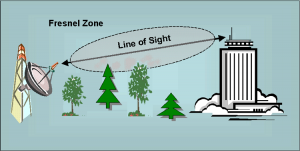 However, the radio waves don’t all follow a completely straight line from transmitter to receiver – it turns out that they are distributed in the air in a football-shaped region between the transmitter and the receiver called the “Fresnel Zone.” For short distances, the Fresnel Zone is not that important, but, once you get out over 100 yards or so, it becomes increasingly important: for “good” radio transmission (constant contact with the source and a good rate of data transmission) you want to have the Fresnel Zone 80% open; to just have a fairly reliable connection, it needs to be at least 60% open. 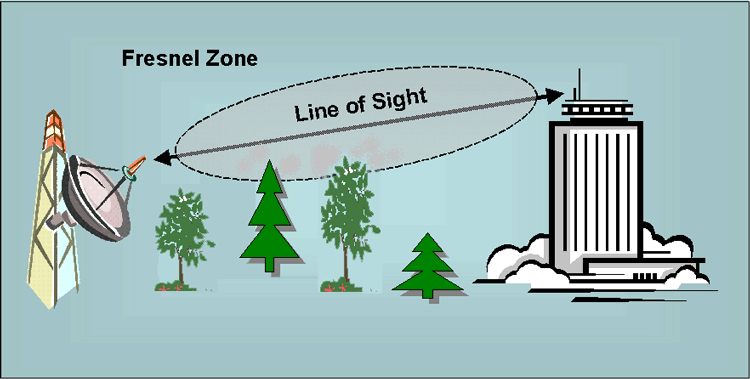 What this means, for instance, is, even if you can see the antenna above a dense stand of trees, you may not be able to access the wi-fi access point from your computer because the trees are disrupting too much of the Fresnel Zone. Indeed, if you have the access point out in the open but only 4 feet off the ground, the ground will start to be more and more of an obstacle as you get further away. The size of the Fresnel Zone increases as the distance between the transmitter and the receiver; for instance at 2.4 GHz and a distance of 1 mile, the Fresnel zone is approximately fifty feet across. Removing as many obstacles as possible from the path between your wi-fi access point and your computer. We’ll look at that first one in the next post. This entry was posted in Internet Access, Local Area Networking and tagged Directional WiFi, LAN, long-distance WiFi, rural internet, rural wifi, wi-fi, wifi. Bookmark the permalink. Love the information here. We used your information to put up a wireless bridge from our house to our shop! We are rural and have wireless internet from a local provider. When it’s working we have enough signal to stream netflix and hulu. Generaly, in the evenings we loose to much signal to stream, and sometimes too weak to surf. We have no other internet options where we live other than satellite, but it is limited and not good for streaming tv. Is there an antenna we can put up that would be more ‘powerful’ to possibly keep our signal strong enough to use all day. We do loose it in the daytime some too. We know our ISP provider well, so if something had to be put on his end too, it could probably be done at our expense. I believe we are around 11 miles from the tower, there are obstructions between that can not be dealt with (trees, hills, not buildings). There are lots of good wireless bridge products out there. Depending on distance, obstructions to “line-of-sight,” and interference, different bridge products may help. Ayrstone sells one called the AyrMesh Bridge that’s a 5.8 GHz. unit and extremely easy to set up. Ubiquiti, Engenius, and others have very good equipment that varies from pretty easy to fairly difficult to set up, but inexpensive and readily available on Amazon.com. It’s suspicious that it slows down in the evening, however – is your Internet connection through a Cable TV provider? It may be that the Internet speed itself is slowing down in the evening. You can use speedtest.net to test the speed of your Internet connection from a computer connected directly (preferably via Ethernet cable) to your router. If it goes down to 4-5 Mbps or so, that may be the problem.